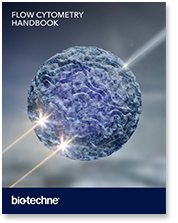 This Flow Cytometry eHandbook provides a brief overview of this challenging technique with numerous data examples. Explore a clear and easy to follow step-by-step guide to flow cytometry that is well-suited for researchers new to the technique, or experienced scientists looking for a quick refresher. We would like to thank Monica DeLay (formerly at Cincinnati Children’s Hospital) and Dr. Aja Rieger (University of Alberta) for their contribution to the eHandbook.